The global painting masking tapes market is foretold to expect high growth prospects while riding on the rise of attractive end-use sectors such as automotive and building and construction. Even though general purpose painting masking tapes may not find the same demand in the real estate sector, specialized products such as those used for abrasive blasting could significantly up the growth of the market in the near future. The rise of automotive manufacturing and metal production could concurrently increase the demand for painting masking tapes. The surge in the sales of automobiles due to rising disposable income is expected to make some contribution to the market. According to experienced researchers, the global painting masking tapes market is foreseen to rise at a CAGR of 5.7% during the forecast period 2017–2022. The market could obtain a revenue valuation of US$3.3 bn by the end of 2022 after progressing from a US$2.5 bn achieved in 2017. The world painting masking tapes market is anticipated to be classified into foam, plastic, paper, and others, according to type of backing material. Out of these markets for painting masking tapes, paper is prognosticated to garner a lion’s share by the end of the forecast period. As per the analysts, the paper market could be valued at a US$2.7 bn by the completion of 2022. The annual absolute growth attained by this segment could surpass that of any other in the same segmentation class. Between 2017 and 2022, paper could grow at a US$0.1 bn annually. With respect to end use, the segmentation of the world painting masking tapes market is predicted to include automotive, building and construction, aerospace, and general industrial and do-it-yourself (DIY) activities. In terms of type of adhesive, there could be crucial segments such as silicon-based, acrylic-based, and rubber-based adhesives contributing to the market. On the basis of geographical classification, the international painting masking tapes market is envisaged to witness the faster growth of Asia Pacific except Japan (APEJ) on the back of its 7.8% expected CAGR. However, North America showcased its dominance in the market in 2017 and is envisioned to be counted among the most attractive regions until the final forecast year while expanding at a 4.0% CAGR. Next on the list of lucrative regions could be Europe projected to be valued at a US$0.7 bn by 2022 end. However, the Middle East and Africa (MEA) and Japan could grow at a lethargic pace, where the former is forecasted to create an absolute revenue opportunity of US$0.07 bn and the latter to lose 8 basis points (BPS) by 2022 over 2017. Some of the most prominent players operating in the worldwide painting masking tapes market could be 3M Company, Berry Global, Inc., Nitto Denko Corp, Saint-Gobain Performance Plastics Corporation, Scapa Group PLC, Intertape Polymer Group, Inc., Beiersdorf Aktiengesellschaft, Shurtape Technologies LLC, Bolex (Shenzhen) Adhesive Products Co. Ltd., and Advance Tapes International Ltd. The global painting masking tapes market is envisioned to be pampered for a widespread growth due to an extensive range of applications which includes sandblasting, spray painting, stoving, stenciling, wet painting, and general purpose masking. Products that offer removal without residue and ease of use could garner a vigorous demand in the coming years. Other applications such as printed circuit board manufacture and powder coating are foreseen to showcase prominence with the rise of high temperature masking tapes. The analysts authoring this publication are keen on dedicating attention to detail not only when calculating statistics but also market projections and factors affecting growth. With the help of this productive guideline, industry players are expected to ensure a strong growth in the global painting masking tapes market. The world painting masking tapes market is prophesied to fairly rely on the popularity and applications of backing materials and adhesives used. For instance, some manufacturers would want to use paper backings such as filmic, flatback, or creped while others may employ foam or plastic, depending on the demand of end users. Such characteristics of painting masking tapes are studied to be influenced by the temperature at which they cure or dry, coating or paint system, and nature of application. One of the primarily used adhesives could be rubber-based; however, silicone-based adhesives could be required if temperature reaches more than a 160°C. Having that said, temperature resistance may not be a prerequisite for sandblasting and other masking applications. Sometimes, a thick, strong backing could prove to be vital for resistance to an abrasive under high pressure. The success of painting masking tapes is projected to also depend on their ability to leave no residue, allow clean removal, and cause no damage to the substrate. The international painting masking tapes market is envisaged to be segregated as per backing material, end use, and adhesive type. In terms of backing material, the market could see a classification into foam, paper, plastic, and others. Amongst these segments, paper is anticipated to outperform all others in the category with a larger revenue share. It could grow at a 5.7% CAGR during the forecast period 2017–2022. 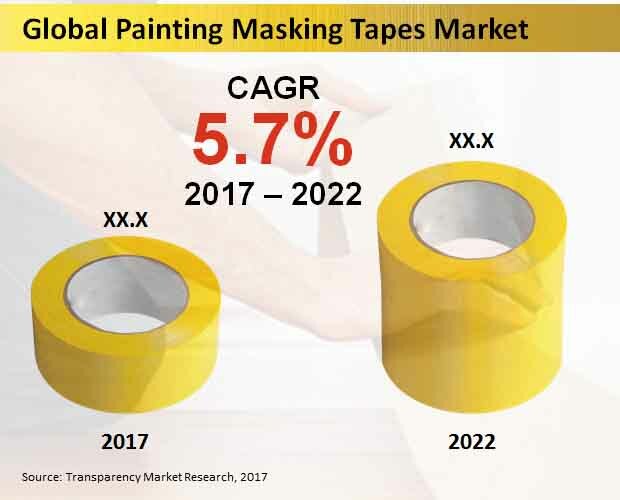 By end use, there could be vital segments such as automotive, building and construction, aerospace, and general industrial and do-it-yourself (DIY) activities taking shape in the international painting masking tapes market. By type of adhesive, the market could be divided into silicon-based, acrylic-based, and rubber-based adhesives. Regionally, North America dominated the international painting masking tapes market on the basis of revenue. However, Asia Pacific except Japan (APEJ) is prognosticated to earn a greater share of US$0.9 bn by the end of 2022. The market could also witness a segmentation into Japan, the Middle East and Africa (MEA), Latin America, and Europe. In view of competition, leading companies such as 3M Company, Berry Global, Inc., Nitto Denko Corp, Saint-Gobain Performance Plastics Corporation, Scapa Group PLC, Intertape Polymer Group, Inc., Beiersdorf Aktiengesellschaft, Shurtape Technologies LLC, Bolex (Shenzhen) Adhesive Products Co. Ltd., and Advance Tapes International Ltd. could make their mark in the worldwide painting masking tapes market.